Struffoli, a small dough balls, and I mean really small, the size of marbles, that are deep-fried and then rolled in honey before being assembled into a cone as in the French piled-up profiteroles model or a bulging wreath, is a Christmas sweet, but in Sicily is usually prepare this special sweet in carnival day. Get out a large, rimmed baking sheet and shake the semolina over the base. And get out another tray (it doesn’t have to be a baking sheet) and line it with a double layer of paper towels. Set both aside while you get on with the dough. Beat the eggs, sugar, finely grated lemon zest, and 2 tablespoons of olive oil until frothy. Gradually add about 2 2/3 cups of the flour and the baking powder, and mix to a dough. If it is too sticky, then add more flour and keep kneading, using either your hands or a freestanding mixer fitted with a dough hook, until you have a smooth, pliable dough. This doesn’t take very long: probably around 3 minutes or 5 by hand. Gently lower, using a mesh scoop or perforated spoon, about 15 little dough balls at a time. At first they will sink and then, as they cook, they’ll float to the surface and begin to turn golden brown. This will take up to about 1 minute depending on how many you have in at a time, but be ready to fish them out with your mesh scoop or perforated spoon onto the paper towel–lined tray as soon as they become the right golden color. And keep watching your pan. Continue to cook them in batches—making sure the oil returns to the correct temperature but doesn’t get too hot or bubble too vigorously—until they are all fried; you can pile them up on the tray without harm. Now turn off the heat under the oil pan, and move on to the adhesive and assembly stage. Wash the honey from your hands and shake your chosen sprinkles over the sticky wreath, then stand back and admire, before placing your creation where others can do likewise. 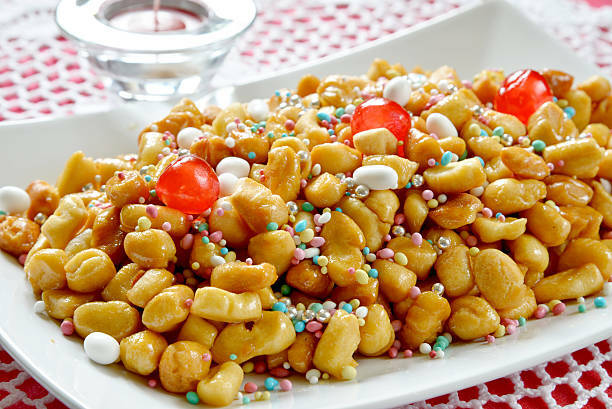 These struffoli are best, to my mind, eaten on the day they’re made. Use a scoop or spoon and fork to serve. It will be a sticky affair, but that’s part of their charm.